I’ve been toying for a while now with the idea of starting a new series of posts devoted to my favourite authors. There are a few writers whose work I turn to over and over, and who’ve all been huge influences on my own writing. I’ve recently been reading new work (well, new to me…) by a couple of them, so it seemed like a good time to try this out. I’ll start with Alan Garner. But where to start…? This man has had such an impact on my life and my writing. He’s really the perfect writer to begin with, as he’s one of the first authors I ever fell for. 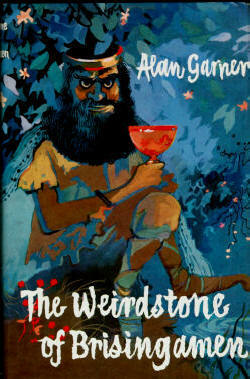 His award-winning book, The Weirdstone of Brisingamen, must have been the first fantasy novel I ever read. It’s certainly the novel I’ve read the most. I was probably about six years old when I first read this book, and at the time, I may have been too young to appreciate it. I remember enjoying the story, but it wasn’t until I re-read it several years later that I really fell in love with it. It’s a love affair that’s lasted my entire life. I’ve read it dozens of times, to the point where my old battered copy is incredibly fragile and has to be handled with great care. I can’t bring myself to upgrade it to a new edition. It’s a book that I had to read at least once a year during my childhood, and it’s one of those rare childhood reads that stands the test of adulthood. I read it again quite recently, and found it as engaging and mesmerising as ever. It’s a fantasy story involving children, but it isn’t the least bit childish. It deals with some dark, heavy stuff, and contains the most visceral, claustrophobic scene I’ve ever come across. You’ll never go potholing after reading this book. It isn’t just that Weirdstone is a superb story (which it is). It’s Alan Garner’s characteristic writing style that makes it so enduring. He is a genius at creating atmosphere. I can’t think of another author who manages to create such an all-encompassing, beautiful, unsettling, sense of being within a story. You’re not just in Alan Garner’s books while reading them; they’re in you. And around you. All good writers wrap you up in their stories, but Garner is a cut above. He completely immerses your senses. And he does it in the most simple, minimalist way. I’d go as far as to say he’s a minimalist writer. Some of his books demonstrate this more than others, particularly his books for adults. He’s very sparing in description and visual cues. He creates his atmosphere through emotion, and above all, landscape. All of Alan Garner’s books evoke the landscape he sets them in, which is usually his native Cheshire. Landscape is almost a separate character in many of his stories, none more so than Weirdstone. I can’t hear of Alderley Edge without getting a little thrill up my spine. I’ve just finished reading Thursbitch, one of his adult novels, and it’s almost entirely devoted to the landscape. That’s what it’s about. The characters are almost secondary. Yet it’s an amazing, immersive, surreal story that says a huge amount using very few words. When I was in my teens, I made it my mission to seek out every Alan Garner book the library could supply, and I devoured them all. The Moon of Gomrath (sequel to The Weirdstone of Brisingamen) freaked me the hell out and left me frightened of my shadow for days. I re-read it recently, and although it didn’t scare me quite so much, it still contains one of the most spine-tingling scenes I’ve ever read. Elidor immersed me in the possibilities of worlds beyond our own, The Owl Service was dark and magic and consuming, and Red Shift introduced me to Garner’s trademark minimalism and his recurring themes of parallel existence. When I need to pare my writing back, I turn to Alan Garner. When I need to immerse myself in dark alternate realities in order to spark that brooding sense of other, I turn to Alan Garner. When I need to feel the power and magic that landscape can impart to a story, I turn to Alan Garner. He was my favourite writer when I was ten, and he’s remained one of my all-time favourite writers to this day. His work evokes such a unique sense. His stories are richly imagined and vary greatly, but they all have a feeling of connection. Nobody else tells a story the way he tells them, and nobody else’s stories feel like his. It his Garnerishness that I love so much. And the only way to impart what that means is to read one of his books. Love this post by Laura Lam. Failure is an option. It’s giving up that isn’t. I bought a bag from a charity shop with those words on them when I was fifteen. I knew enough French to know what “est le fondement de la réussite” meant, but not the first word. I showed my French teacher on the Monday. At fifteen, I didn’t really get it. I was such a Type A personality as a teen. I mean, I still am, but back then an A- would make me cry for an hour. I’m not joking. Perfectionism had caused problems for me–overworking myself in school, acute anxiety, an eating disorder, and a constant, internal refrain that I wasn’t good enough. How was failing even an option, much less a foundation for success?